We make the right impression, literally, by imprinting your logo on thousands of products and apparel pieces. We make the right impression on our customers by providing them with unmatched support, professionalism, and marketing expertise. That expertise, along with those products, helps our customers make the right impression on their customers and employees (and their boss!). And, we always try to make the right impression on our community. 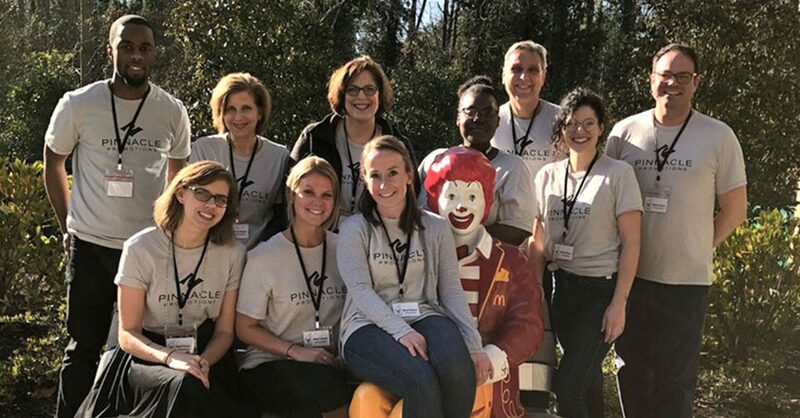 When Pinnacle Promotions began more than 20 years ago, it was founded on a premise of doing good work and being good people. That desire has never left the heart of owners Mitch and Dave Weintraub. Recently, Pinnacle Promotions partnered with Martin Genauer and the law firm of Berger Singerman to support the Foundation Groupe Jean Vorbe in Port-au-Prince, Haiti. Together, we worked to provide the children at the Foundation and the Foyer Divin Orphanage with more than 500 blankets and convertible bag-backpacks filled with pens, pencils, erasers and other school supplies. The Foundation was kind enough to send along pictures of some very happy children. I acknowledge receipt of your letter from the 11th and thank you. I take this opportunity to ask you to send Martin Genauer and Pinnacle Promotions, on behalf of Foundation Jean Vorbe and the orphanage Foyer Divine, my most sincere thanks. I attached some pictures of the children receiving the blankets that will be so useful for the coming cool months. Once again, thank you or having thought of us and wish you the warmest regards. The value of giving back into the lives of children is immeasurable. We consider ourselves fortunate to have been a part of making a difference for school children in Haiti.